Displaying ads on a pay-per-click model can be expensive. Companies, and people, who manage Google Adwords campaigns know the effort required to achieve good performance. Saying that, the payoff of from Google Adwords can be immense. It can help you get a constant stream of bookings, orders or whatever you count as a conversion for your company. There is a large number of factors which influence Adwords performance. In this post we’ll be looking at the use of ad extensions to improve the performance of your ads. Ad extensions provide more information on your text ads. This information can include your reviews, phone number, information on other services, etc. The following list briefly discusses the extensions and who should use them. Call extension – A simple method of displaying your phone number on the ad. It appears alongside the URL and can be measured for incoming calls. This is useful for businesses which need to speak to their customers for sales or support purposes for e.g. a law firm. Location extensions – You can display your address for customers to easily find your store or office. As expected, this extension is useful for businesses which require customers to visit them in person for e.g. a restaurant. Seller ratings – This is a very effective way of improving the appearance of your ads by displaying star ratings collected from a third party service like Trust Pilot or Reviews. The latter is the more affordable service. You’ll need at least 30 verified reviews before your ratings are displayed, and they are automatically displayed; so not something you have control over. Callout extensions – These extensions display bite sized information about your service or product. They need to be one or two word features/benefits about your service or product. Sitelinks extensions – These extensions are useful for showing links to other pages on your website. They can be very useful in displaying relevant information and features of the product/service, while directing users to the relevant pages. The screenshot below shows an ad which is using multiple Adwords extensions. The use of extensions can help improve the performance of your ads through an increase in clicks at potentially lower costs. The lower costs can be achieved through improved quality scores. Extensions are necessary, but you’ll also need effective ad copy, a well designed PPC landing page and clear marketing to communicate with your audience. 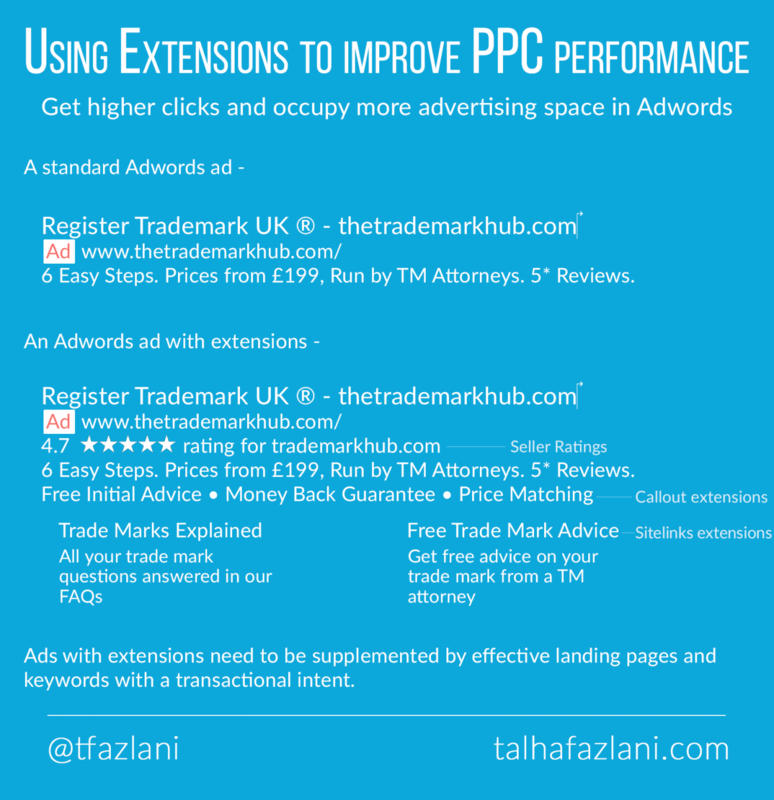 If you don’t already, you should look into using extensions to improve your Adwords performance. Your competitors are likely to be using them already. Link building is now a fairly difficult activity in SEO. Obtaining natural links through press articles or high quality blogger outreach is not something everyone can achieve. As a result, small to medium sized businesses will suffer the most because of limited resources and marketing budgets. So what’s the alternative you might ask ? Content marketing is your answer. The strategy is simple. Create enough content around your primary keywords and start ranking for long tail keywords. But, there is a method to creating such content. It needs to be comprehensive and written to inform, educate and provide expertise in your subject area. An example of this could be a website that sells market research services. The content that needs to be created should cover all aspects of market research from creating a market research survey to analysing market research responses. The more topics you cover with in-depth knowledge, the better your chances of ranking for long tail keywords. Topic of the content – As stated above, the content should be around your primary keywords. You need to cover all different aspects of your primary keywords. This involves answering questions around your keywords, educating others about your subject area and sharing expert knowledge. This will help build relevancy for your website and help improve rankings. By writing such content, you should be able to cover all related keywords (look up Latent Semantic Indexing) for e,g. if your primary keyword is ‘social media’, then related keywords will be ‘Facebook’, ‘Twitter’ and ‘hashtags’. Content structure – It should be easy to read and follow a post. Content that is broken down into digestible paragraphs works best. Make use of bullet points and interactive elements like accordions, tabs or hover over text to display content in a cleaner format. 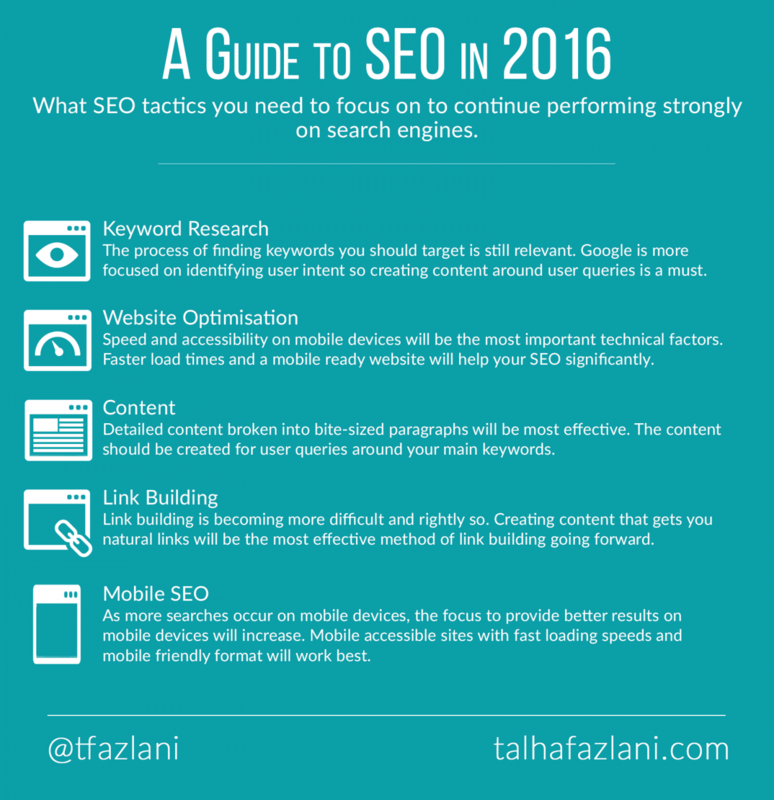 For mobile SEO, it is important to follow such guidelines for a good user experience on mobiles. Outbound & internal links – There are varying opinions on how useful outbound links are. Some consider outbound links to be an important factor in indicating relevancy to search engines while others don’t see much value in them. I think they are useful and the quality of the outbound links is the most important aspect. The same applies to internal links which helps search engines find relevant content on your own website. Use keyword rich anchor text naturally in content to create such links. Length of content – In a recent study conducted by BuzzSumo for Moz, it was found that content between the range of 1,100 to 1,300 achieved top ranking on search engines. Neil Patel from KissMetrics follows this content strategy, and has achieved significant success. Sharing knowledge is important and what could be better then covering your subject area in-depth for marketing purposes. It will help increase traffic and generate leads/conversions for your website. Further, if you write enough content and share it amongst a relevant audience on social media, your reputation will grow online. With SEO becoming even more competitive, following such tactics will help you achieve your SEO goals. SEO has continued to evolve since it become a popular online marketing strategy. Most SEO tactics that were used 5 to 10 years ago are now considered obsolete. Gone are the days of keyword stuffing, directory submissions and link exchanges. As we get inch closer to 2016, lets look at the SEO tactics that you should use to continue to perform strongly on search engines. Keyword research – Finding keywords that you should optimise your website for remains important. Using tools like Google Adwords Keyword Tool, SEMRush and many others, you need to find keywords that help drive traffic/conversions. Rather than stuffing your content with these keywords, you need to write content around these keywords for e.g. if your primary keyword is ‘trade mark registration’, you should write content on subjects like ‘how to register your trade mark online’ etc. Google will put emphasis on user intent so providing content that answers the intent will help you perform well organically. Website optimisation – The stronger a website from a technical perspective, the better your chances of performing well on search engines. Website loading times have always been very important and will continue to play a prominent role in 2016. Mobile accessibility is going to become a major player owing to increasing mobile traffic. Make sure your website is mobile ready and complies with Google’s standards. Content – The more information you share, the more relevant your website will be for your keywords. User intent is a growing focus of search engines. Developing content that focuses on user intent is the way to go. If you sell mobile phones, you should write content on the best budget mobile phones or mobile phones with this best cameras. This will help you answer information searches and target long tail keywords. Link building – It’s becoming increasingly difficult to get links and rightly so. The link building tactics used a few years ago should not be used anymore. Getting links through blog posts is still effective, however the focus should be on creating content that gets interaction. Creating blog posts and guest posting for the sake of links is not a strategy to pursue. Shareable content, journalistic pieces and methods which generate links naturally will be the strategies to pursue. For smaller businesses that struggle with link building, the focus should be on creating great content for their website. Mobile SEO – Mobile optimisation will overtake desktop optimisation this coming year. Mobile searches have overtaken desktop searches which naturally makes mobile the greater focus for search engines. Websites which are fast, light and provide content in a mobile friendly format will get a better organic reach. Focus on building light websites which offer a good mobile user experience and bite seized content. SEO is ever evolving. Following the above tactics will help you perform well this coming year. SEO is a long term effort which means that building a better website and great content will be part of a greater marketing and promotion strategy. It goes without saying that old habits die hard, but changing your SEO habits will make sure that your website doesn’t suffer organically. This is an overview which I will expand on, in parts, at a later stage. Once you get the basics done, you can obtain data to improve and expand your campaigns. 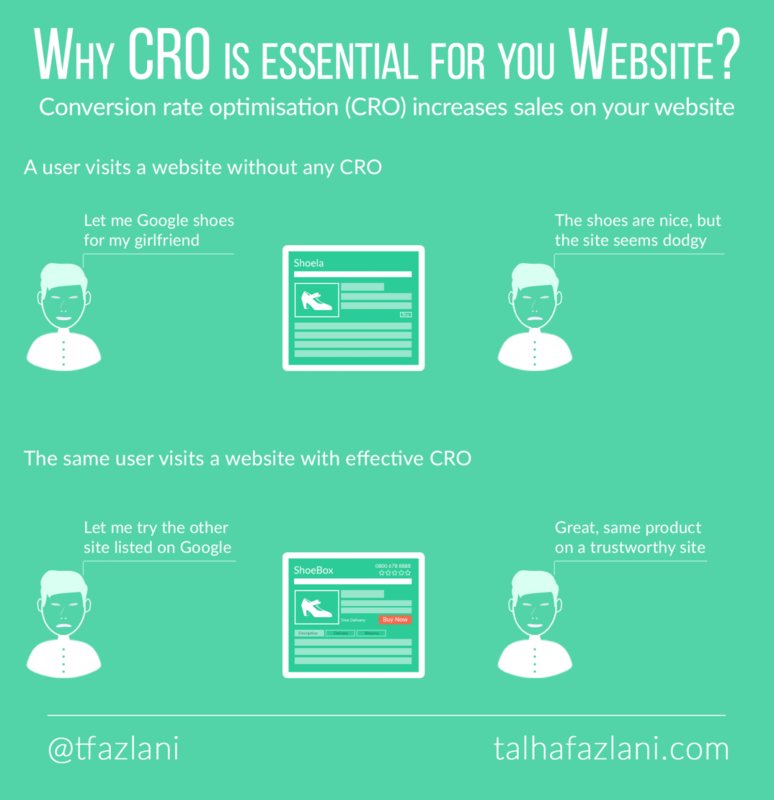 Why CRO is essential for websites? SEO and, to a lesser extent, PPC are commonly used by companies with an active online marketing plan. Conversion rate optimisation (CRO), or conversion optimisation, on the other hand doesn’t often get the attention it deserves. CRO is the process of converting more of your visitors into customers. It involves identifying what your website users are looking for and providing it to them. The infographic above illustrates this point by giving an example of an e-commerce site, which heavily relies upon CRO to increase conversions. From a business perspective, the reason CRO is essential is obvious, it maximises sales or leads from an existing pool of visitors. I am of the opinion that CRO should come before any traffic generating work is started. The reason is simple, there is no benefit in getting a lot of traffic when you cannot convert it. Online giants like Amazon, eBay and Airbnb focus greatly upon this and their success is testament to effective CRO. I would just leave it at that. What work does SEO include? You should expect this from any SEO consultant or agency working on your campaign. Working on a single element from the above won’t achieve much results. And once again, never pay to get links unless you don’t care about the future. As the image above illustrates, you multiply the search volume with the average CTRs and you’ll get the estimated traffic. The estimated traffic can be used to calculate conversions by multiplying it with the average conversion rate. Finally, multiply the conversions with the average value and you have the amount of revenue you can generate from just one keyword. It’s best to make sure that the keywords you target are different from each other. This way there won’t be any overlap between the search queries. Its also wise to be clear about the time it will take to get certain ranking positions. Not every SEO campaigns results in the top position being occupied by your client. 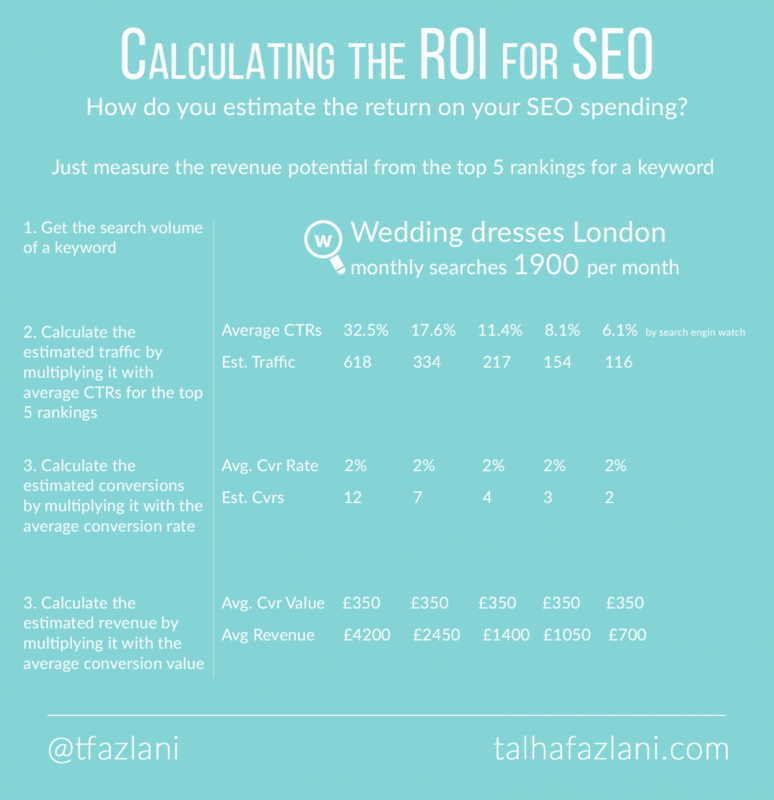 My opinion is that SEO isn’t a process that can easily be held to ROI targets. It includes tasks that will help drive sales from other methods and not just organic search listings. But, for the sake of convincing clients of its potential, the above method ought to do. I have had a few opportunity to work on large-scale multilingual SEO projects for well-known brands. It makes sense to pursue a multilingual SEO strategy or even a multi language online marketing strategy if your company has the ability to do so, but it’s not as easy as you might be led to believe. The list can go on but you get the idea. Having a multilingual strategy is a part of an actual expansion to foreign markets. It’s not an exclusive practice that will open up a market for a company. It might give you an idea of what it is like, but in order for the market to make a profit, the effort should be sustained. I am still an advocate for multilingual SEO but only for companies which can pursue a longer term strategy. Most SMEs should make the most out of the market they start in before expanding abroad. The costs, time and effort required might just not be readily available. Search engine optimisation (SEO) seems to change very often in how its practiced but some things remain the same. Keyword research is still done the way it was five years ago. 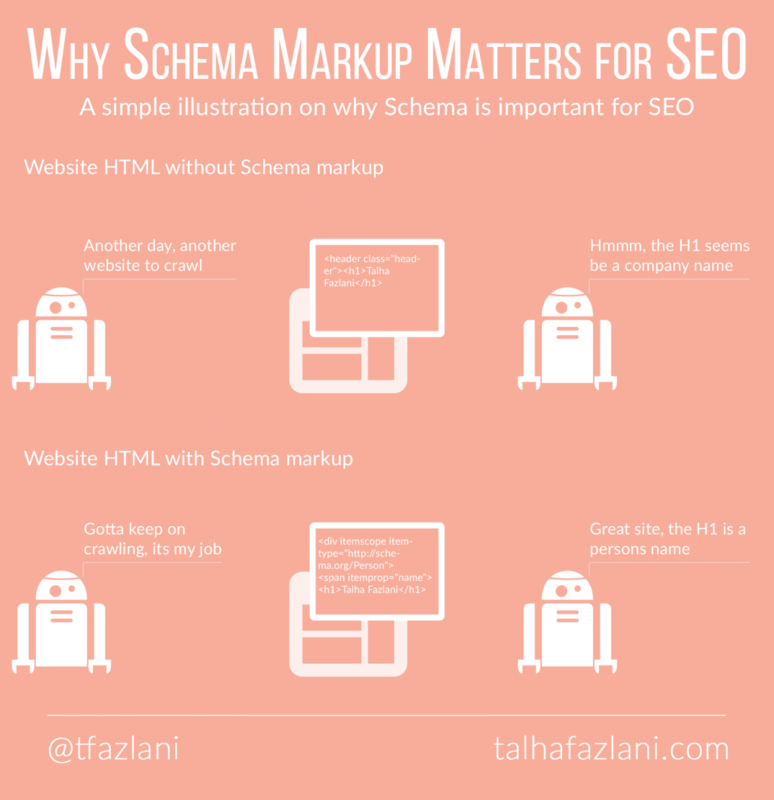 The same applies to other elements which make up SEO as we know it today. Going back to keyword research, an overlooked part of it is user intent, which basically describes the purpose of a user’s search query. Its easy to get lost in big numbers with broad keywords, but they are often the wrong keywords to rank for and target. 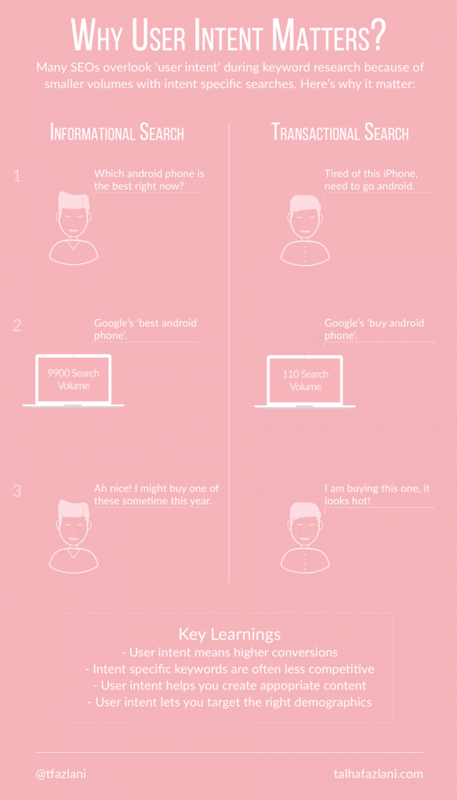 The infographic above describes why user intent is so important when keyword research is being conducted.